Learn to swim like a dolphin | Hello World! It used to be only a dream but since I live now in Adelaide, I tend to think that maybe someday… who knows?! Actually when I have learnt I was moving to Australia, I got excited and automatically started to think about things I wanted to do, places I wanted to visit. The first thing that came to my mind was “See the wild dolphins”! We moved to Australia in September 2014 and I decided I will go and see the Dolphins the day of my birthday! I guess I wanted to make it special! I think it is nice sometimes to spice the day! It was a very pleasant moment I must say. I was sitting on the upper deck, my hair dancing in the wind, listening to the Captain’s comments about Port Adelaide history. 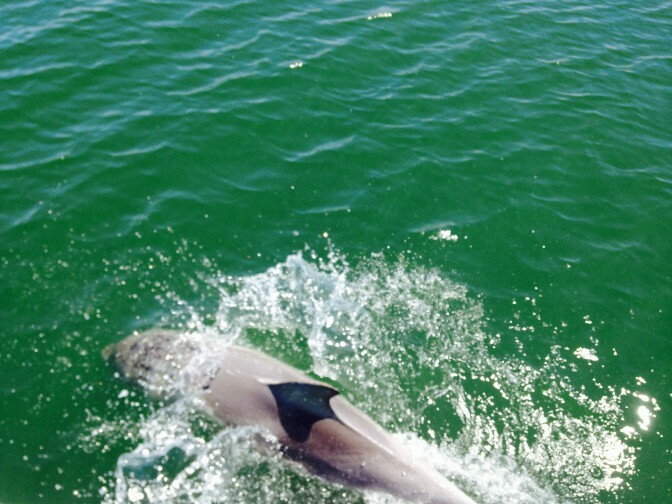 Suddenly a group of dolphins showed up and started to swim along the vessel. They were absolutely gorgeous. What a moment! The cruise went on and I really enjoyed my time. At some point, people started to get inside the boat to have lunch in the restaurant. I chose to stay outside to enjoy the show as much as possible! A group of young people showed up on the upper deck with beers and sodas to celebrate which I thought was a good idea. I mean even if you are not lucky and you do not see a single dolphin, you can still enjoy a lovely cruise with a fresh drink. I know this sound silly but the dolphin looked so happy, so free… enjoying the swim, sometimes jumping, going up, going down, playing with the boat. It woke up my inner child and I was totally amazed… it was a lovely feeling. I could not help smiling…I felt so good, so happy, so alive! “Dolphins are social mammals, capable of enjoying their lives. They form close bonds with other members of their group.”Peter Singer. When you think of it, we are not that different. We need to bond with people, to be part of “groups”… We are unique but in the same time we are shaped by our social environment. Our need to connect with others is fundamental and gives us meaning. It is part of our happiness to share and to interact. It is what makes our lives so special and interesting. Don’t you think? It is as simple as that: learn to swim like a dolphin through life, meet as many people as you can, connect with them, make friends, enjoy your time on earth and above all SMILE!